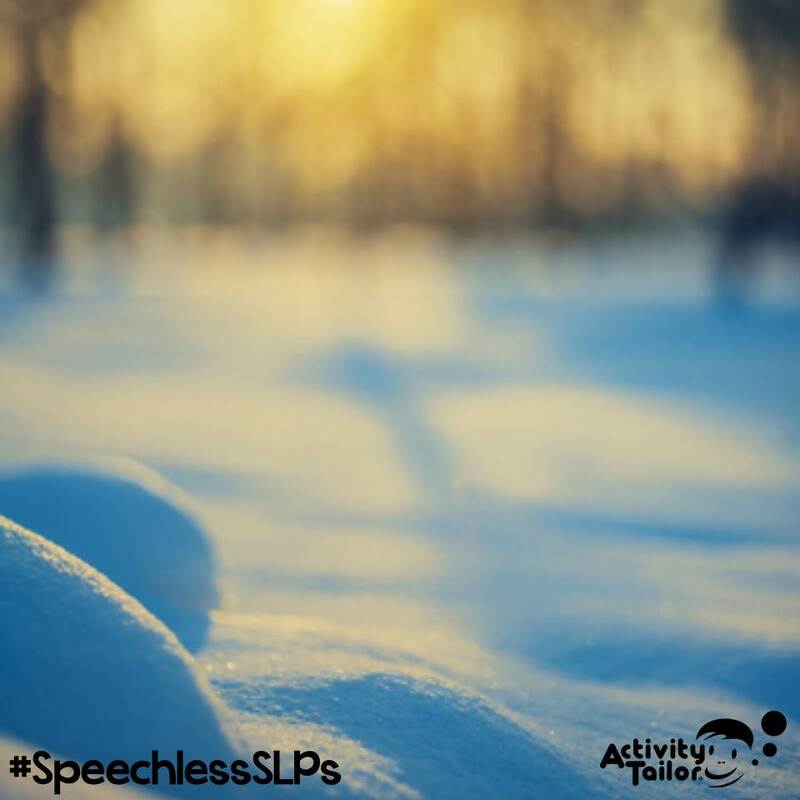 Typically I write a post at the beginning of the month about what’s happening in the speech room but with December being such a short month with so many special activities, I decided to do something a little different this month. Instead, I have decided to link up with Kim from Activity Tailor to talk about what leaves me speechless. Of course there are the personal happenings that leave me speechless. The fact that my oldest son, who is now 20, couldn’t get out of bed for much of his high school career. I can’t even recall how many times he was tardy one his junior year. It also took him 5 years and two high schools to graduate. He is now waking up every morning at 5am for boot camp for the Navy. The most unbelievable part is that he likes it! Leaves me feeling thankful and speechless. There are also the professional moments that can leave me speechless. While I am hardly ever am at a loss for words and consistently have to work on keeping my mouth to myself, there are times when I am rendered speechless at work. Almost always when I hear large groups of young children singing, do I get a little choked up. Every December the kindergarten classes put on a holiday show and they perform the song “This Little Light of Mine”. It gets me every time. When I see my students up on that stage and they are performing along with the rest of their peers, it always leaves me feeling proud and speechless. There are other smaller moments that can leave me speechless. Last week, one of my students, who is diagnosed with autism, was laying on the carpet and playing with cars and racetracks with three other boys, requiring no more assistance than any other second grade boys would require. It was only a few years ago that this same student wasn’t really communicating with peers or interacting with them, despite the interest. Today, he can be found right in the thick of it on the playground. There are many people between school staff, his family and therapists from outside agencies, who have helped to build his skills, but knowing that the small adult facilitated groups co-taught by me and the OT, have contributed to this moment leaves me speechless. There are also the comments from parents. It can be a quick comment in passing or a note at the end of the year. I didn’t enter this field for the praise, but it is nice to hear that what I’m doing matters to families. Some of my favorite comments are: “He can talk on the phone to his grandparents and they can understand him.” “He can order his own food at a restaurant.” “My friend, who volunteers as lunch, said my son looks like all the other kids and he doesn’t stand out as having a disability.” Knowing that I am providing more than “lessons” but changing the quality of someone’s life in some small way, leaves me feeling speechless. There are also my colleagues. I am fortunate enough to work with an extraordinary team of women, many of whom I have worked with for over 15 years. I am proud to work beside these talented teachers and therapists, who are also my friends. I know that I can count on them no matter what. Whether it’s helping with paperwork that I can’t get to, covering a co-treat so I can get to a slew of evaluations due all at once, bringing me my favorite “shake” because I could use it or helping me pack up my house when I was moving, these ladies will do whatever it takes. These women leave me speechless. With all of the business of life and work, it can be easy to get caught up in the minutiae that so easily drags us down. It’s nice to take a moment, especially this time of year, to reflect on those moments and people who touch us and can leave us speechless. 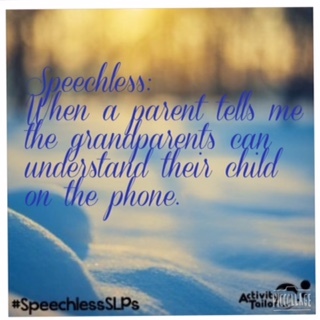 Who and what leaves you speechless?